Russia's state-sponsored television network RT was already at risk of losing its UK license over coverage of the Salisbury nerve agent attack. An interview with the prime suspects leaves it skating on even thinner ice. The network broadcast the interview with the suspects in the Novichok poisoning of Sergei Skripal and his daughter Yulia in the United Kingdom on Thursday, even as it faces multiple ongoing investigations by media regulator Ofcom into its coverage of the attack in March. A British woman died four months later after coming into contact with a perfume bottle containing the chemical weapon. UK authorities have pinned the poisoning on two Russian men they believe are intelligence officers, and charged them in their absence with conspiracy to murder, attempted murder and use of the nerve agent. Many news organizations would likely chase an interview with the suspects. But Ofcom is already investigating whether RT has breached the broadcasting code by failing to ensure its coverage of the Novichok attack has been balanced. The regulator said that as of Thursday evening, the interview had not yet triggered any new complaints but industry experts said the network had taken a big risk by airing the interview in the manner they did. RT aired an interview with the two men suspected by UK authorities of poisoning former Russian spy Sergei Skripal and his daughter. "RT is already under intense scrutiny and this is certainly not going to help matters," said John Enser, a partner in media law at CMS in London. "This is only likely to increase the level of scrutiny." 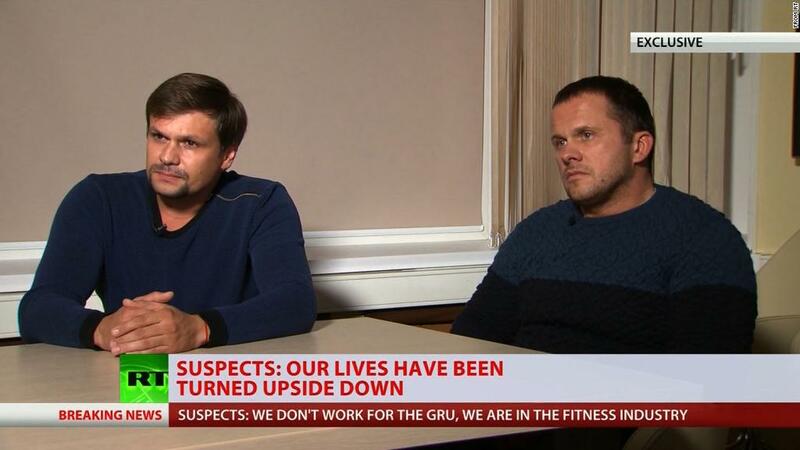 RT editor-in-chief Margarita Simonyan conducted the interview with the men, identified as Alexander Petrov and Russlan Boshirov. They claimed to be tourists who were visiting the city where the assault took place to see its historic cathedral and denied any involvement in the attack. Simonyan said during the interview that the two men called her cellphone, asking to tell their story. RT said they refused to show their passports or give details on exactly what they do or where they work. A UK government spokesperson said the United Kingdom is "clear" that Petrov and Boshirov are agents with Russian military intelligence and slammed the interview as "lies and blatant fabrications." RT's Simonyan noted during the interview that the UK authorities have accused the men of being members of Russian military intelligence. And a correspondent speaking after the interview said that it gave "their version of the events" but "leaves more questions than answers." Speaking to the BBC later on Thursday, Simonyan said though she had no reason to believe the two suspects, she also had no reason to believe the British "secret services who have been lying previously." Asked whether the interview reinforced the view that RT is a Kremlin propaganda outlet, Simonyan said her questions to the suspects were "hard" and had made them "nervous." "Your question to me seems like typical Western propaganda," Simonyan said, before hanging up. Media lawyers said the interview with the Salisbury suspects could trigger another Ofcom investigation. "I have no doubt that Ofcom will look at it," said Mark Stephens, a senior member of the law firm Howard Kennedy. "The interviewer didn't challenge them in any meaningful way." "Ofcom looks at these cumulatively," Stephens said, "but there comes a point when there are so many breaches that they aren't regarded as a fit and proper person to carry a license." Ofcom said in April that since the Salisbury attack they had observed "a significant increase in the number of programs on the RT service that we consider warrant investigation as potential breaches of the Ofcom Broadcasting Code." Its investigations into RT relate to the requirement that UK broadcasters commit to "due impartiality." "Where there is a controversy, they have to not give undue prominence to a particular side, so where we in the UK are saying these people were officers of the Russian state and assisted by the Russian state, RT have effectively majorly focused on the Russian perspective to the story," said Emma Banister Dean, a partner at Royds Withy King. Both Banister Dean and Enser said they believe RT is close to having its license revoked. "I think this is likely they will be found to be in breach of broadcasting code with regard to their failure to balance their coverage," Banister Dean said. It's not clear when Ofcom will complete its investigation. RT did not immediately respond to a request for comment. Simonyan was mentioned 27 times in a report by US intelligence agencies in January 2017 about Russian meddling in the 2016 election. The report described RT as the Kremlin's "international propaganda outlet."